Moving with your pet can be a stressful time on both of you, but after the move is when the true stress really begins for your pet. Dogs, cats, and other pets are incredibly attached to their territory. The home they live in — filled with familiar sights and smells — brings them comfort and security. Unlike us, they cannot immediately regain this feeling of security in a new home once a few of their belongings are unpacked. Instead, they will feel anxious and insecure for a few weeks or even months until the home smells more like them and they become familiar with their surroundings. For those who want the process to go quicker and more smoothly, the following seven tips can make the transition easier on your pet and less stressful for you. The first thing your pet needs is an “island” they can call their own inside their new, unfamiliar home. At the very least, this small bit of territory can be a crate or travel carrier filled with blankets that smell like them. If you can, provide a pet an entire room to themselves with the door shut, allowing them to inspect the area unsupervised. While some pets may be anxious when left alone, the stress of being told not to do certain things in their new home can be far worse. It also keeps them out of the way while you are first unpacking or going in and out of the new home. After 30 minutes or so to themselves, you can enter the space to praise and comfort them, maybe even adding in a treat. Try to avoid introducing too many new things into this space all at once. You can let the pet explore their new home in small doses throughout the next couple of days, but they will at least have a “home” to return to even in all the confusing newness. If you have a cat or dog, you should try to play with it after giving it an hour or two to calm its nerves. If you have a dog — or a leash-trained cat! — a walk is even better since it gives them the opportunity to explore their new space more readily. Try to stick close to the house and do multiple “laps” at first rather than introducing too much at once. Routines are incredibly important to pets. If you had a routine in your old home, do everything you can to maintain it in the new one. Try to stick to a set feeding and walking schedule, and be structured about the times animals given free reign of the new home. After about a week, they should feel confident and comfortable enough through their new routine to discourage anxiety-based behaviors. As much as you can, try to use items from your old home that spread your pet’s scent throughout the space. If you intend to replace all your furniture, hang on to a few old blankets or favorite t-shirts and use those to help reintroduce scents into your new home. For cats, comforting sprays like Feliway can reduce anxiety and prevent territorial spraying. Dogs who have never run before may try to escape if left outside unsupervised after a move. They will need a few weeks to feel comfortable enough outside that they feel the territory is theirs, as opposed to longing for their old territory back home. For this reason, do not leave them outside unsupervised for the first month or two. Outdoor cats are even worse in this department. They will take more than a month to feel comfortable outside, so try to avoid letting them out for their first few weeks until they feel attached to their new home. Otherwise, they may feel an urge to run back to their old home. If you can, structure their outside time so that they are not left alone for more than a half hour at a time for the first few months. Leash training can help outdoor cats get used to their new home in a structured way, too. Recognize both your pet’s emotions and your own during this tense time. Your pet may be more prone to act out because of their stress, and you may have a shorter temper as a result of your own stress during the move. Be more patient with your pet than usual, and resist the urge to raise your voice or discipline them if they exhibit unusual behaviors. Traveling with a pet, especially by air, can add to problems when introducing them to their new home. 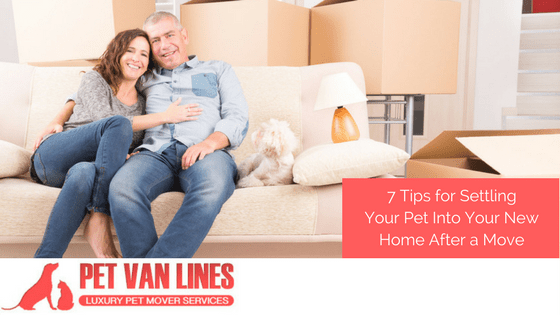 You can reduce this stress and make the move more enjoyable by using a pet transportation service like Pet Van Lines. Get your furry friend where they need to be without unnecessary stress or interrupting your schedule when you ask for a free quote today.